For some reason it seems like almost every July 4th holiday we are haying. We had a decent run of good haying weather earlier in June, but we were too busy getting the gardens in?at that point. So the next window — of course — came over the July 4th holiday?weekend. The forecast started off showing we had five good days — most of them at least “mostly sunny,” if not “sunny.” It was a comfortable amount of time. But then a day before we were going to start mowing, we had a torrential downpour — over an inch of rain in a few hours. That meant giving up the first day of the window to just letting the standing grass and saturated ground dry out before we could mow. Still, we had four days left — a little tighter than we liked, but we had to go for?it — the grass was three to four feet high, and starting to lodge (fall over) in wind and rain because it was so tall and heavy. Alayne took these first two photos of me mowing the field on the 3rd. The sun was coming in and out of clouds, which is not ideal — you want full sunshine to start drying out the grass. But you work with what nature gives you! 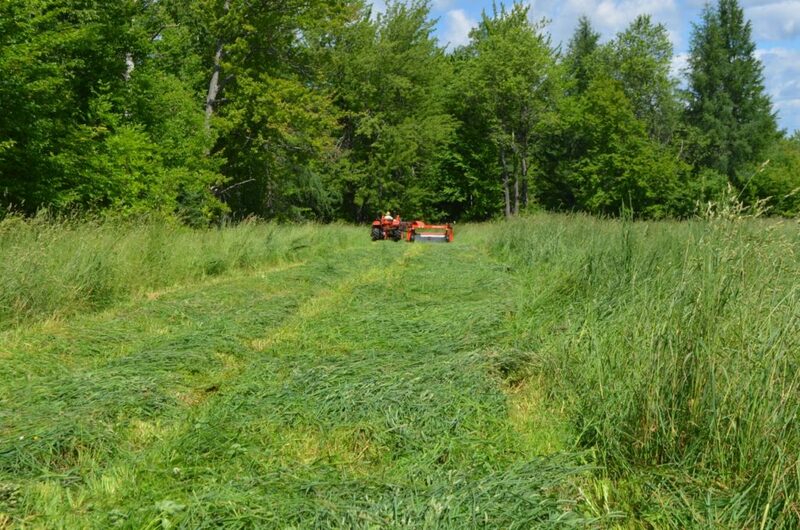 The next day we tedded the field, which means picking up the mown grass and scattering it up in the air and across the ground so it gets stirred up, exposing more of the grass to the sun. I tedded in the morning and Alayne tedded in the afternoon. It turned out to be a hot, sunny day — perfect for drying hay. We would ted the hay once more the following morning, then rake it into windrows for the baler in the afternoon, and bale the fourth day. That was the plan. The weather forecast still had the same forecast for us, so we had two more good days to go. Or so we thought. When we got up on the third day, July 5th, the forecast had literally?changed overnight. Now we had a 20% chance of showers that afternoon, and a 30% chance of showers on the fourth day. When you have a field of newly mown hay on the ground, those are not chances you want to take. Suddenly we had to do everything in one day — ted, rake, and bale. Egads. Plus get it in the barn! I could tell within the first few minutes of baling, as I heard the baler “click” every time it ejected a new bale from the machine, that we were going to have a lot more?bales from this field this time. 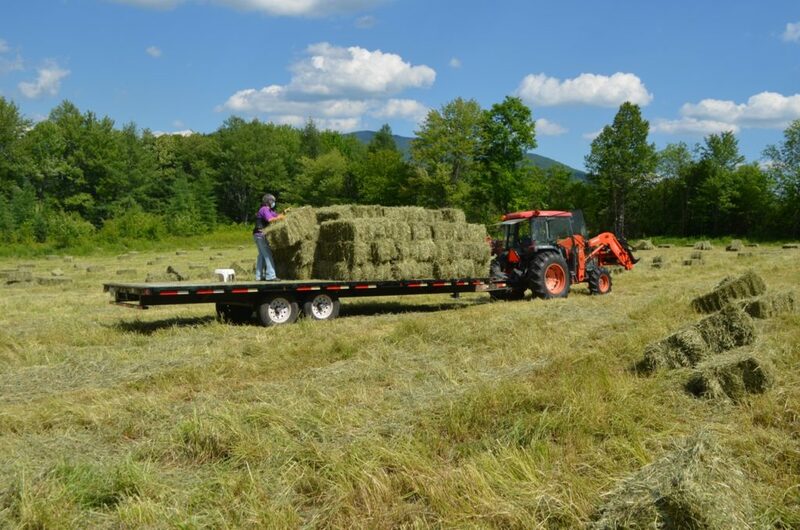 Last year we had about 200 bales on the first cutting, which is a comfortable number for the two of us to get out of the field and into the barn. This was a field we had renovated a few years ago, turning from overgrown shrubby ground back into the productive hayfield it had been decades ago. So every year it was getting more productive, thanks to lots of manure spreading. As I began baling, Alayne pulled the tractor with the hay trailer into a corner of the field, ready to start moving bales onto the trailer. By the time I finished baling, the baler counter showed 309 bales. I looked across the field, dotted with the bales, and groaned. It was already late afternoon, and we had a long way to go. Normally I would have been delighted with the dramatic increase in productivity, but given the hour, I think I would have been happier to see just 200 bales laying on the ground! We’d fill that trailer, drive it over to the hay barn, then unload and stack in the barn. Repeat. Despite only having three days, the hay turned out to be perfect. Some of the very best hay we’ve ever produced. We were amazed at how great it looked. For the third and final load, we cheated: We parked the loaded trailer in the side shed of the hay barn and left it to unload another day! It was already 8 p.m., we were beat, and the dogs hadn’t eaten yet. By the time we got back to the house, we expected to find the dogs banging their bowls on the floor, demanding their dinner. They weren’t too happy with us when we finally showed up, but we pointed out to them that we hadn’t had our dinner, either. Post-script: Of course — of course! — there were no showers that day. Or the following day, the fourth one in our original haying window. It was another hot, sunny day. 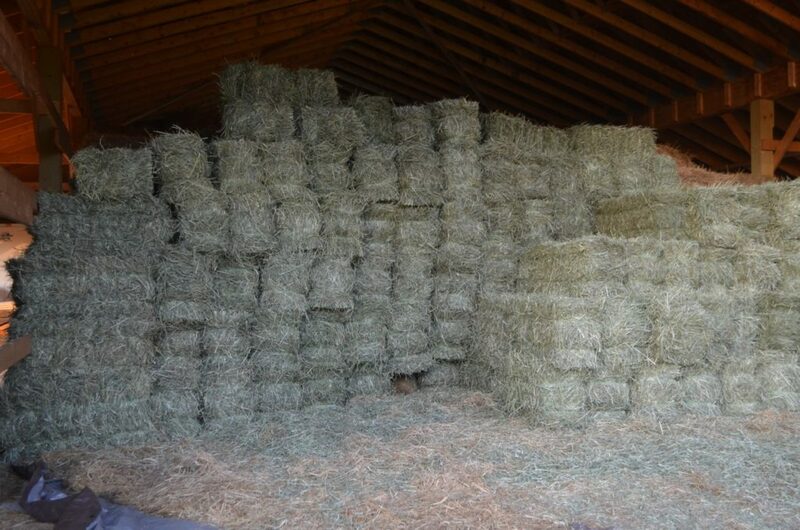 All we could say was: At least the hay’s in the barn! Wow! I’m exhausted just reading about your holiday! Hope you were finally able to get some much needed rest. So glad you had a good harvest. That’s a lot of hard work. Congrats on getting it accomplished!!! Just reading this made me feel exhausted! 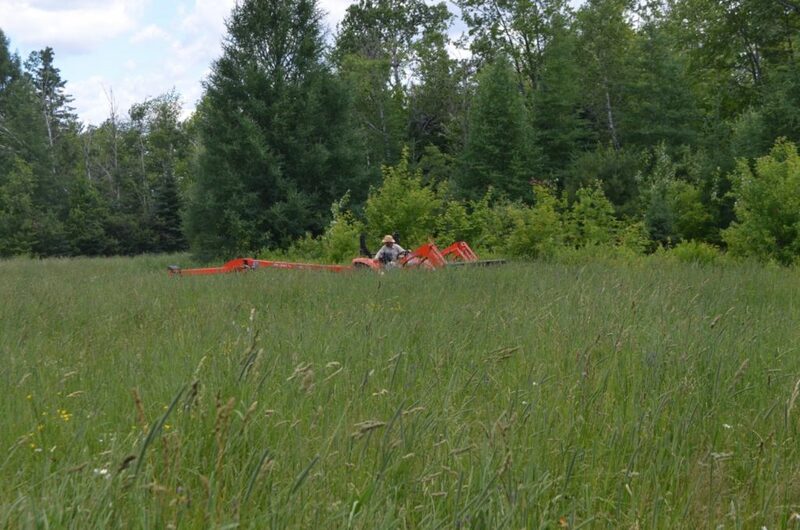 Haying is such hard work, especially when you are rushing ahead of the weather, and when there are only two of you. It’s great that you had such a good yield and were able to get it all under cover. And hopefully you enjoyed a little rest the next day! What a lot of hard work in a short amount of time! It will go down as “the best hay we ever baled.” There is no perfume sweeter than a load of fresh hay. Can you hook the wagon behind the baler? That is what we used to do. Then you stack as you go and no lifting from the ground up. Connie, good question about the wagon. 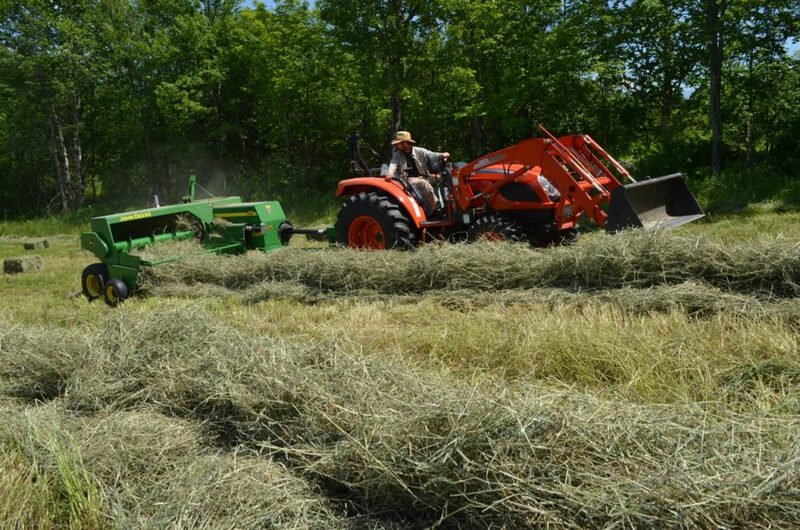 Our tractors are not powerful enough to have the “kicker” option on the baler (the mechanical part shoots the bales up and onto a wagon) or to pull a loaded wagon behind the baler. You folks are simply amazing! 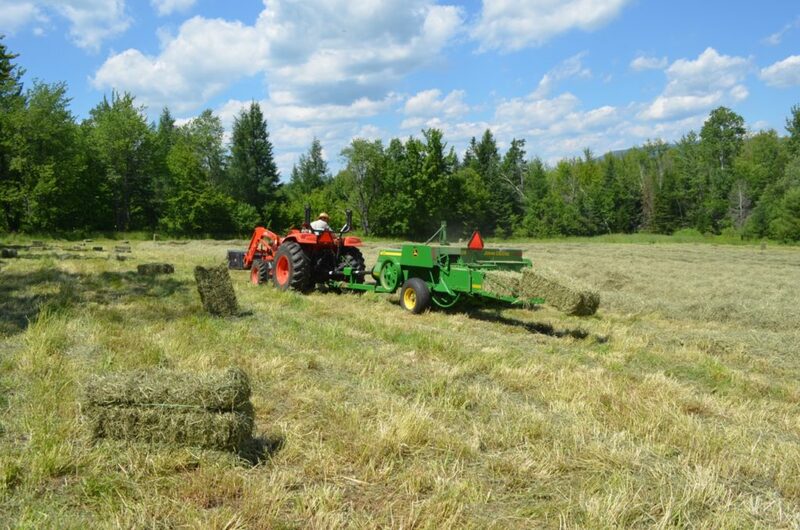 First, gardens, and then the haying, both of which are hard work. I got my first introduction to bucking hay onto a flatbed at the tender age of 8. I was quickly enamored of my hay hook, a most useful tool. I eventually was assigned to drive the tractor while my father and uncles loaded the hay. I still got covered in hay bits, but sweated a lot less. It took all of us to get it up into the loft and I stacked inside. We baled many acres and it was several days of bailing, loading, and stacking. What I see here are possibly the two strongest and healthiest people I know! We should all be so lucky, to be able to do rewarding physical labor. I bet you both feel a huge sense of accomplishment at the end of the day. I also bet you can eat pretty much anything you want!! So, how’s the back’s, the shoulders, and the knee’s feeling, on this side of the job?? I agree, haying is one of the most satisfying farm jobs there ever was. What with the clean fields, and the barn larder stacked to the rafters. It makes a farmer feel so productive and that sense of a job well done. But as I approach 65, I’m thinking these kind of jobs need some young muscles. How about you give some summer jobs to some High School kids next summer, at the very least for the hay stacking portion. Handling each of 306 bales two times, is a lot of work. Bet if I took a vote of the four-legged residents of Rolling Dog Farm, they’d all agree with me. Just to get their dinner on time! !